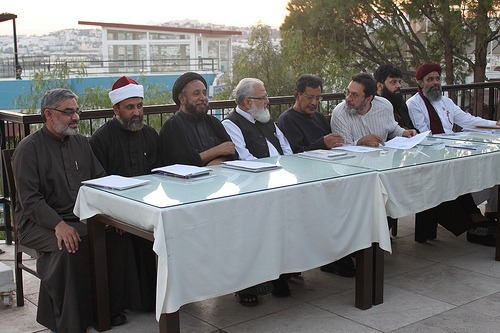 The 11-point UJN Pakistan Unity Declaration commits the signatories and the UJN to sign statements in the upcoming Islamic month of Muharram denouncing the killing of fellow human beings on the basis of colour,creed, ethnicity or religion as haram. The statements will also declare excommunication or takfir against fellow Muslims and abusing the Prophet Muhammad’s family and companions to against Shariah. The accord is based on Charter 3:103, initiated by the Islamic Human Rights Commission in 1997 and also addresses the challenging problem of madrasas in Pakistan, believed to be a breeding ground of intolerance, recommending that syllabi and curriculums should address the need for respect, harmony and peace among all members of Pakistani society. The signing of the declaration is a determined step out of the quagmire of murder and fear that has come to characterise the landscape in Pakistan, said The Chair of IHRC Massoud Shadjareh. The event brings back hope that one day Pakistan can put the internecine strife of the current era behind it, said the co-ordinator UJN Mohideen Abdul Kader. The declaration was signed by Sahibzada Muhammad Hamid Raza (Sunni Ittehad Council), Allama Ibtisam Elahi Zaheer of Jamiat Ahle Hadith , Allama Syed Niaz Hussain Shah of Hoza Ilmia Jamia Al Muntazar. Allama Mohammad Sadiq Qureshi (Minhaj ul Quran International), Maulana Syed Ali Murtaza Zaidi (Jamay Imamia), Liaqat Baloch,MP (Jamaat-e-Islami) and Muhammad Sarwat Ejaz Qadri (Pakistan Sunni Tahreek).